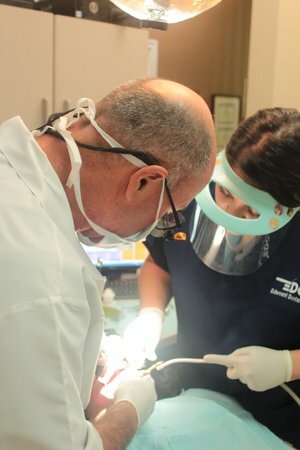 At Echeverri Dental Center, we strive to provide all of our patients with exceptional dental care. The excellence of our dentistry services is made possible with leading-edge dental technology. Technological advancements in dentistry, coupled with modern dental techniques, have made dentistry more efficient, effective, and comfortable for many of our patients. 3D Cone Beam Imaging: 3D cone beam imaging provides more comprehensive X-rays at a fraction of the time traditional X-rays take. It is so innovative because it is able to capture X-rays from multiple angles of your face. These angles and scans combine to create a 3D X-ray of your entire face. Our 3D imaging allows us to give precise diagnoses, administer more accurate treatment, and reduce the time of your appointment. It is easy to use, too! All you have to do is stand underneath the cone beam. Then, the camera, located on the arm of the cone beam, will rotate 360 degrees around your head, capturing 3D images of your face. Then, you’re all set! This process typically takes less than a minute! Intraoral Cameras: Intraoral cameras are an innovative alternative to dental mirrors. They allow your dentist to more efficiently view the interior of your mouth. With an intraoral camera, your mouth’s interior will be projected onto a screen for more detailed viewing. Your dentist can show you problem areas in your mouth and walk you through certain procedures with an intraoral camera. Your dentist can also take photos of your mouth for future references. Digital Crown Impressions: Digital crown impressions eliminate the need for sticky, uncomfortable impressions of the past. With digital crown impressions, we can measure the exact specifications of your mouth to create the perfect dental mold for you! Digital Records: At Echeverri Dental Center, we’ve gone paperless! All of our paperwork is conducted electronically. You can fill out a form online or on our in-office iPads. This ensures more efficient record keeping. We can also send your digital records to other doctors to give you better treatment. Visit Echeverri Dental Center to see and experience our state-of-the-art dental technology for yourself. With these ingenious dental advancements, we can help you have a more positive experience at the dentist!